On an "Up North" vacation to explore and enjoy the splendors of Northern Wisconsin and the Western Upper Peninsula, our first stop was in the town of Florence, Wisconsin. Like something out of a Norman Rockwell painting, downtown Florence features a Main Street (a.k.a Central Avenue) with a cafe, church, laundry mat, funeral home, and ice cream shop. Looking for the more "family friendly" attractions, here's what we did, where we ate, and where we stayed on our mid-August visit. 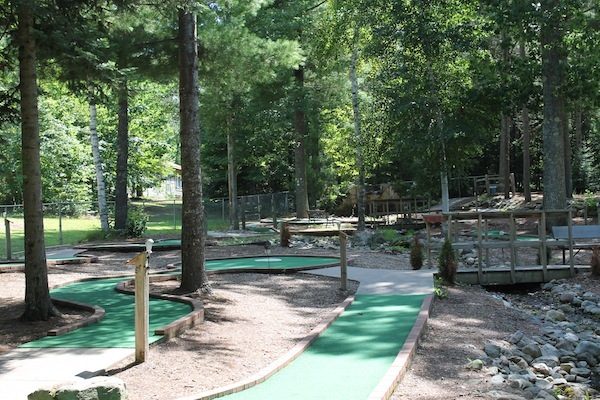 Located just outside of Florence on Highway 101 (near the Keyes Peak ski area) is Keyes Lake Mini Golf course, an 18-hole course available to the general public and campers staying at the Keyes Lake Campground. 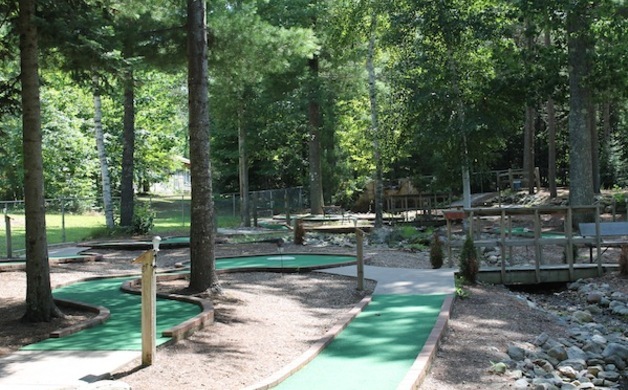 This shaded course is well maintained and has a few different types of water obstacles to keep things interesting; it stays open until 10PM and is lit once the sun goes down. 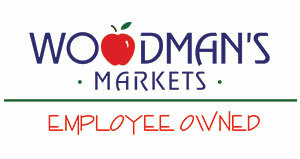 If you're hungry when you're all golfed out, just run up to the camp store for a snack. While we didn't think to bring our swim suits, a swimming beach is within a short walk/drive across the way at Keyes Lake. 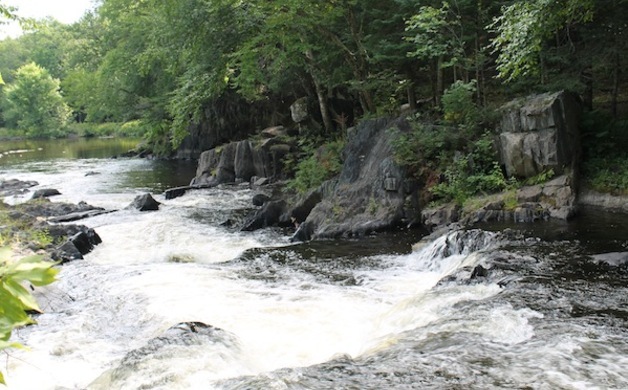 The highlight of a visit to Florence County is the fourteen different named waterfalls and rapids located on the Pine and Popple Rivers—Part of the Wisconsin Wild Rivers Tour (download the Android or the iPhone Mobile App before you go). 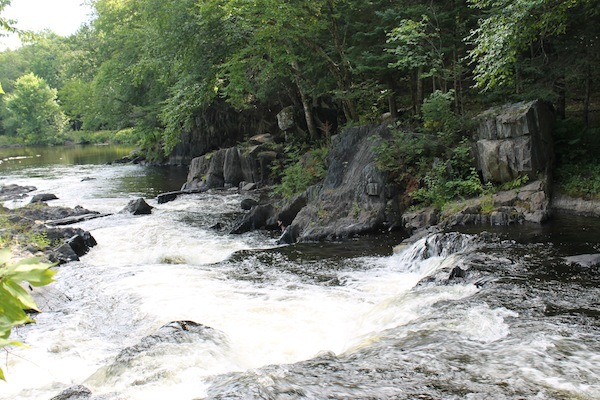 We settled on Big Bull Falls, Myers Falls, and Bulls Falls and wrote about our experience in this Wisconsin Waterfalls post. 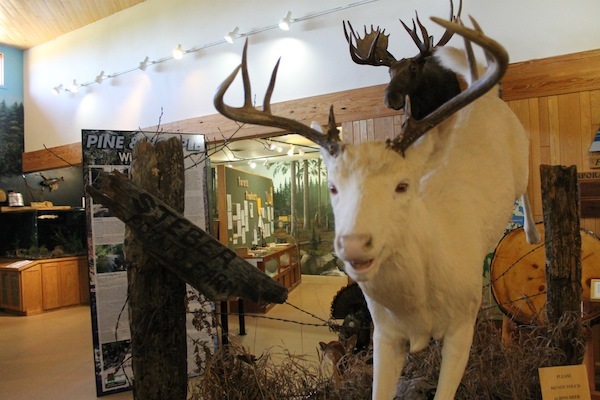 On your way in to Florence, make sure and stop at the Wild Rivers Interpretive Center to familiarize yourself with the flora and fauna of Northern Wisconsin. Here you will see several mounted animals, including an albino deer, a wolf, and a brown bear. 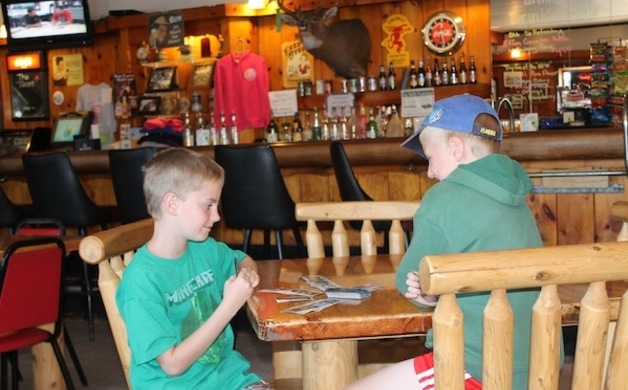 This is also a great spot to pick up maps and pamphlets on area attractions and learn about the rules and regulations for hunting, fishing, and ATVs. If you have kids, you fill find a small playground, clean bathrooms, and a nature trail with an easy-to-find geocache. There's also a small gift shop here if you're looking for a t-shirt or post card. 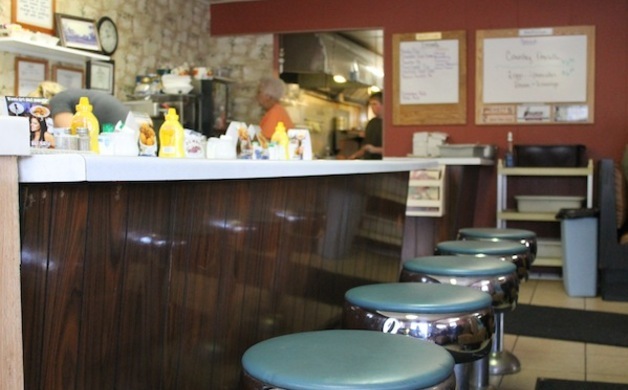 Located at 633 Central Avenue, Barb's Cafe serves breakfast and lunch and is a popular spot for enjoying a hearty meal that will stick to your ribs. The kind of place you would expect to find a counter full of men wearing flannel shirts and drinking strong coffee, our lunchtime stop included grilled cheese for the kids and a bowl of homemade pepper and sausage soup for me. If you bring the kids, prepare to spend all of your extra laundry quarters on plastic rings and temporary tattoos (garnered from the machines located near the front entrance). A nice spot for a burger and a beer, The Tavern on Central (500 Central Avenue) is just across the street and one block down from Barb's Cafe. Surrounded by neon beer signs and bucks with ribbons on their antlers, the wooden chairs and pine trim confirm you are truly in God's Country. 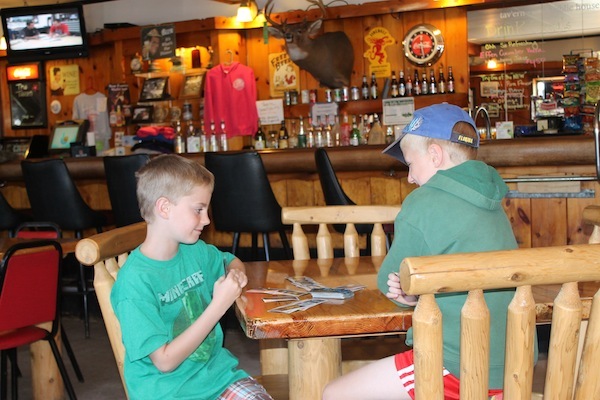 While we waited for our food, the kids played a heated game of King's Corners and I sang along to a Patsy Cline song on the juke box. By the time we had finished, the locals were rolling in to play pool and enjoy a 5 o'clock beer. If you're into gambling, you'll find a few online games and a jar of pull tabs (Just for the fun of it, we may have purchased a couple of cards. No winners - boo!). 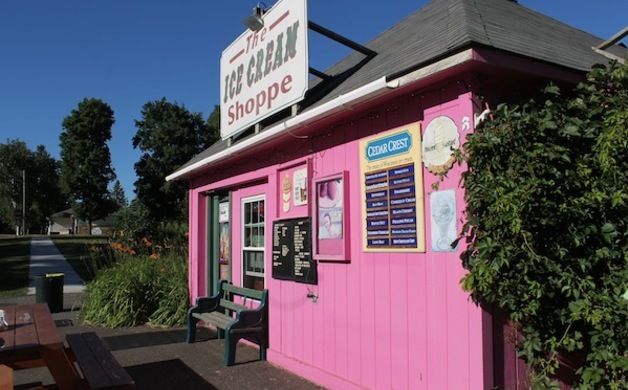 If you need to satisfy your sweet tooth, leave room for a stop at The Ice Cream Shoppe (232 Central Avenue). 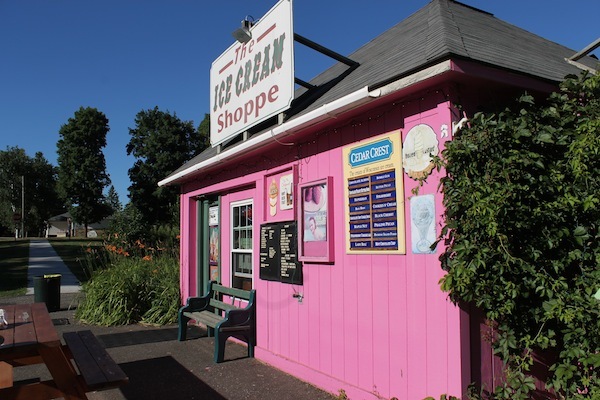 Serving candy, popcorn, and ice cream treats (cones, shakes, malts, sundae's), take your treats outside and enjoy a summer evening with the family. The Ice Cream Shoppe also has a small gift area, featuring clothing, candles, jewelry and the like. Just make sure your kid's ice cream is pushed all the way down into the cone, or you'll end up paying for a replacement scoop (doh!). 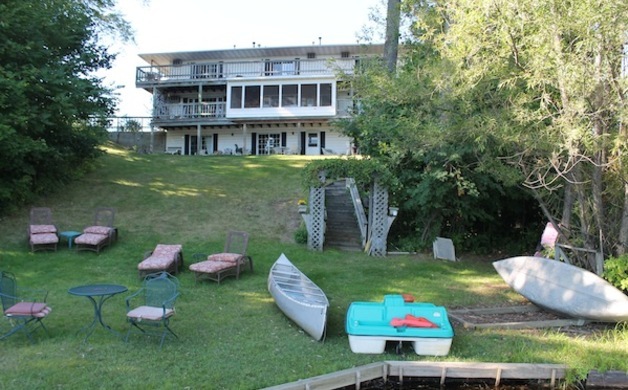 One of the best things about Florence, Wisconsin is the Lakeside Bed & Breakfast located on the East Side of town (within walking distance of The Ice Cream Shoppe). 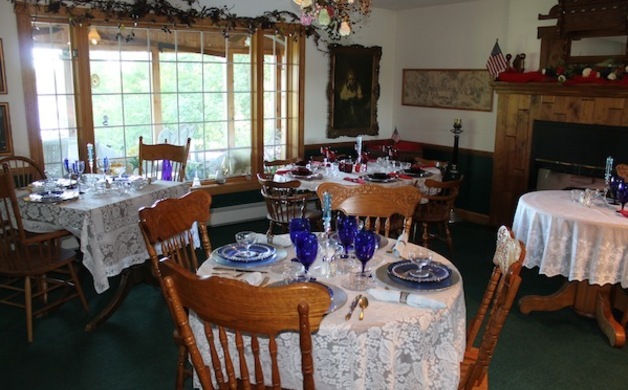 Built on a hill overlooking Fisher Lake, Lakeside Bed & Breakfast features rooms on the second level, main floor, and lower level (where we stayed). 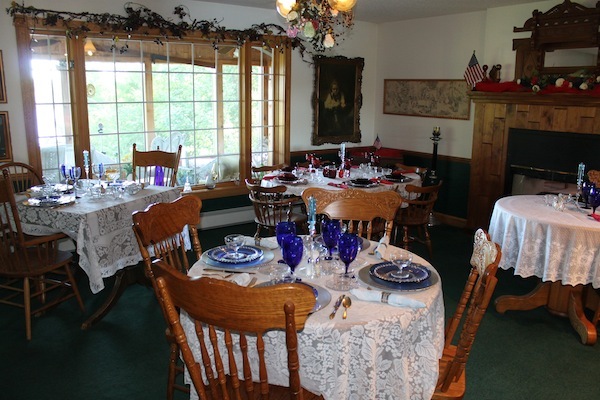 Family owned-and operated, any doubts I had about bringing children to a Bed & Breakfast quickly dissipated as the owner talked about her own grand kids (and even had a wicker basket full of toys in the room just off the kitchen). This was our first time staying in a Bed & Breakfast and I had to explain to the kids that we weren't getting "breakfast in bed." With WiFi and common rooms to spread out and relax, we felt right at home even among the other guests. 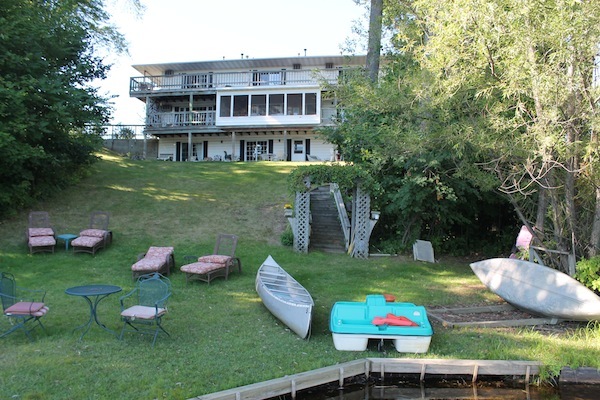 Truly the highlight of our visit was free use of the paddle boat and canoes (and since our lower level room had a walkout sliding-door to the hill, we were able to run-up and down to the lake without tromping up and down stairs). Any disappointment we had in missing out on breakfast in bed was easily remedied with a "fancy" breakfast served in the dining doom with lit candles and a fire in the gas fireplace. A welcome change from reconstituted eggs and coffee in a Styrofoam cup, if you've stayed in as many hotels and motels as we have, you'll appreciate "real" food as much as we did.